Tall Waterhemp (Amaranthus tuberculatus (=A. rudis)) is a dicot weed in the Amaranthaceae family. In Illinois this weed first evolved resistance to Group K3/15 herbicides in 2016 and infests Corn (maize), and Soybean. Group K3/15 herbicides are known as Long chain fatty acid inhibitors (Inhibition of cell division (Inhibition of very long chain fatty acids)). Research has shown that these particular biotypes are resistant to acetochlor, dimethenamid, pyroxasulfone, and S-metolachlor and they may be cross-resistant to other Group K3/15 herbicides. Field, and Greenhouse trials comparing a known susceptible Tall Waterhemp biotype with this Tall Waterhemp biotype have been used to confirm resistance. For further information on the tests conducted please contact the local weed scientists that provided this information. There is no record of differences in fitness or competitiveness of these resistant biotypes when compared to that of normal susceptible biotypes. If you have any information pertaining to the fitness of Group K3/15 resistant Tall Waterhemp from Illinois please update the database. The Herbicide Resistance Action Committee, The Weed Science Society of America, and weed scientists in Illinois have been instrumental in providing you this information. Particular thanks is given to Adam Davis, Aaron Hager, Dean Riechers, and Seth Strom for providing detailed information. Hausman, N. E. ; Tranel, P. J. ; Riechers, D. E. ; Maxwell, D. J. ; Gonzini, L. C. ; Hager, A. G.. 2013. Responses of an HPPD inhibitor-resistant waterhemp (Amaranthus tuberculatus) population to soil-residual herbicides. Weed Technology 27 : 704 - 711. Field experiments were conducted in 2010 and 2011 at a Mclean County, IL seed corn production field where resistance to foliar-applied 4-hydroxyphenylpyruvate dioxygenase (HPPD) inhibitors was confirmed in waterhemp. Corn herbicides were applied to the soil at 1 and 2 times (1× and 2×, respectively) the recommended field use rate, while soybean herbicides were applied only at 1× the recommended rate. Waterhemp control and density were determined 30 and 60 d after treatment (DAT). In corn, 1× rates of mesotrione, safened and unsafened isoxaflutole formulations, atrazine, and S-metolachlor provided less than 70% control 30 DAT, while control with acetochlor was greater than 80%. One and 2× rates of acetochlor and 2× rates of mesotrione and unsafened isoxaflutole provided the greatest reduction of waterhemp density across years. At 30 DAT in soybean, sulfentrazone, flumioxazin, metribuzin, and pyroxasulfone provided the highest levels of waterhemp control (84 to 92%), as well as the greatest reduction in waterhemp density both years. A dose-response experiment with soil-applied mesotrione was performed under controlled greenhouse conditions using three waterhemp populations: MCR15 (seed collected from the McLean Co. site), NH41 (progeny obtained from the McLean Co. population by an additional generation of mesotrione selection in the greenhouse), and a sensitive (S). Emergence counts 21 DAT revealed higher seedling survival of MCR15 and NH41 at mesotrione rates of 105 g ha-1 or less compared with the sensitive control. Resistant-to-sensitive (R/S) ratios for NH41 and MCR15 were 12.7 and 8.8, respectively. Field results indicate the McLean Co. waterhemp population demonstrates reduced sensitivity to soil-applied HPPD-inhibiting herbicides. This is supported by greenhouse results that demonstrate reduced sensitivity to mesotrione in MCR15 and NH41..
Ma, R. ; Kaundun, S. S. ; Tranel, P. J. ; Riggins, C. W. ; McGinness, D. L. ; Hager, A. G. ; Hawkes, T. ; McIndoe, E. ; Riechers, D. E.. 2013. Distinct detoxification mechanisms confer resistance to mesotrione and atrazine in a population of waterhemp. Plant Physiology 163 : 363 - 377. 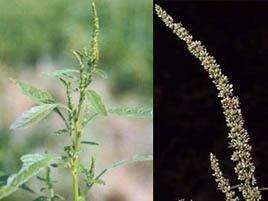 Previous research reported the first case of resistance to mesotrione and other 4-hydroxyphenylpyruvate dioxygenase (HPPD) herbicides in a waterhemp (Amaranthus tuberculatus) population designated MCR (for McLean County mesotrione- and atrazine-resistant). Herein, experiments were conducted to determine if target site or nontarget site mechanisms confer mesotrione resistance in MCR. Additionally, the basis for atrazine resistance was investigated in MCR and an atrazine-resistant but mesotrione-sensitive population (ACR for Adams County mesotrione-sensitive but atrazine-resistant). A standard sensitive population (WCS for Wayne County herbicide-sensitive) was also used for comparison. Mesotrione resistance was not due to an alteration in HPPD sequence, HPPD expression, or reduced herbicide absorption. Metabolism studies using whole plants and excised leaves revealed that the time for 50% of absorbed mesotrione to degrade in MCR was significantly shorter than in ACR and WCS, which correlated with previous phenotypic responses to mesotrione and the quantity of the metabolite 4-hydroxy-mesotrione in excised leaves. The cytochrome P450 monooxygenase inhibitors malathion and tetcyclacis significantly reduced mesotrione metabolism in MCR and corn (Zea mays) excised leaves but not in ACR. Furthermore, malathion increased mesotrione activity in MCR seedlings in greenhouse studies. These results indicate that enhanced oxidative metabolism contributes significantly to mesotrione resistance in MCR. Sequence analysis of atrazine-resistant (MCR and ACR) and atrazine-sensitive (WCS) waterhemp populations detected no differences in the psbA gene. The times for 50% of absorbed atrazine to degrade in corn, MCR, and ACR leaves were shorter than in WCS, and a polar metabolite of atrazine was detected in corn, MCR, and ACR that cochromatographed with a synthetic atrazine-glutathione conjugate. Thus, elevated rates of metabolism via distinct detoxification mechanisms contribute to mesotrione and atrazine resistance within the MCR population..
Nandula, V. K. ; Ray, J. D. ; Ribeiro, D. N. ; Pan, Z. ; Reddy, K. N.. 2013. Glyphosate resistance in tall waterhemp (Amaranthus tuberculatus) from Mississippi is due to both altered target-site and nontarget-site mechanisms. Weed Science 61 : 374 - 383. A tall waterhemp population from Missisippi was suspected to be resistant to glyphosate. Glyphosate dose response experiments resulted in GR50 (dose required to reduce plant growth by 50%) values of 1.28 and 0.28 kg ae ha-1 glyphosate for the glyphosate-resistant (GR) and -susceptible (GS) populations, respectively, indicating a five-fold resistance. The absorption pattern of 14C-glyphosate between the GR and GS populations was similar up to 24 h after treatment (HAT). Thereafter, the susceptible population absorbed more glyphosate (55 and 49% of applied) compared to the resistant population (41 and 40% of applied) by 48 and 72 HAT, respectively. Treatment of a single leaf in individual plants with glyphosate at 0.84 kg ha-1, in the form of 10 1-µl droplets, provided greater control (85 vs. 29%) and shoot fresh weight reduction (73 vs. 34% of nontreated control) of the GS plants compared to the GR plants, possibly indicating a reduced movement of glyphosate in the GR plants. The amount of 14C-glyphosate that translocated out of the treated leaves of GR plants (20% of absorbed at 24 HAT and 23% of absorbed at 48 HAT) was significantly lower than the GS plants (31% of absorbed at 24 HAT and 32% of absorbed at 48 HAT). A potential difference in shikimate accumulation between GR and GS populations at different concentrations of glyphosate was also studied in vitro. The IC50 (glyphosate concentration required to cause shikimate accumulation at 50% of peak levels measured) values for the GR and GS populations were 480 and 140 µM of glyphosate, respectively, resulting in more shikimate accumulation in the GS than the GR population. Sequence analysis of 5-enolpyruvylshikimate-3-phosphate synthase (EPSPS), the target site of glyphosate, from GR and GS plants identified a consistent single nucleotide polymorphism (T/C, thymine/cytosine) between GR/GS plants, resulting in a proline to serine amino acid substitution at position 106 in the GR population. The GR and GS plants contained equal genomic copy number of EPSPS, which was positively correlated with EPSPS gene expression. Thus, glyphosate resistance in the tall waterhemp population from Mississippi is due to both altered target site and nontarget site mechanisms. This is the first report of an altered EPSPS-based resistance in a dicot weed species that has evolved resistance to glyphosate..
Bell, M. S. ; Hager, A. G. ; Tranel, P. J.. 2013. Multiple resistance to herbicides from four site-of-action groups in waterhemp (Amaranthus tuberculatus). Weed Science 61 : 460 - 468. In 2006 and 2007, farmers from two counties in Illinois reported failure to control waterhemp with glyphosate. Subsequent onsite field experiments revealed that the populations might be resistant to multiple herbicides. Greenhouse experiments therefore were conducted to confirm glyphosate resistance, and to test for multiple resistance to other herbicides, including atrazine, acifluorfen, lactofen, and imazamox. In glyphosate dose-response experiments, both populations responded similarly to a previously characterized glyphosate-resistant population (MO1). Both Illinois populations also demonstrated high frequencies of resistance to the acetolactate synthase (ALS) inhibitor, imazamox. Additionally, one of the populations demonstrated high frequencies of resistance to both atrazine and the protoporphyrinogen oxidase (PPO) inhibitor, lactofen. Furthermore, using combinations of sequential and tank-mix herbicide applications, individual plants resistant to herbicides spanning all four site-of-action groups were identified from one population. Molecular experiments were performed to provide an initial characterization of the resistance mechanisms and to provide confirmation of the presence of multiple resistance traits within the two populations. Both populations contained the W574L ALS mutation and the ΔG210 PPO mutation, previously shown to confer resistance to ALS and PPO inhibitors, respectively. Atrazine resistance in both populations is suspected to be metabolism-based, because a triazine target-site mutation was not identified. A P106S EPSPS mutation, previously reported to confer glyphosate resistance, was identified in one population. This mutation was identified in both resistant and sensitive plants from the population; however, and so more research is needed to determine the glyphosate-resistance mechanism(s). This is the first known case of a weed population in the United States possessing multiple resistance to herbicides from four site-of-action groups..